[ Reginald L. Hine, author and attorney. ] 10 Signed Letters (7 in Autograph; 3 Typed) to Franziska Hyde, regarding his writing and hers, with four letters to her from his wife following his suicide, and copies of Hyde's letters to him. Eight on his letterhead, Willian Bury, Letchworth, Herts. 1948 and 1949. Her letters from 7 Byron Place, The Triangle, Clifton, Bristol. The collection of 35 items in good condition, lightly aged and worn. A good-natured playful correspondence on both sides, with both parties delighting in literary byways (Hine signs one letter 'Yours in the love of learning'). 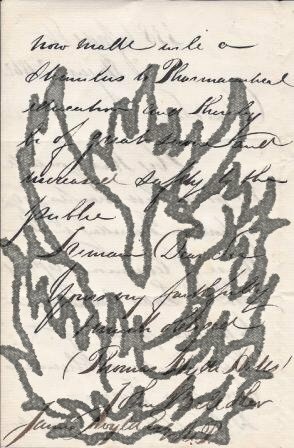 ONE: 10 Signed Letters (7 in Autograph; 3 Typed) to Franziska Hyde, and one unsigned Autograph Letter Signed, regarding his writing and hers, with four letters to her from his wife following his suicide, and copies of her letters. Between 5 October 1948 and 20 February 1949. [ Privately-printed keepsake playlet by Mary Hyde about Colonel Ralph Isham and the purchase of the Malahide Papers of James Boswell, with signed inscription by the author. ] Levée at Fifty-Third Street. Printed in Great Britain at the University Printing House, Cambridge (Brooke Crutchley, University Printer). 1972 [ inscription dated 1971 ]. 19 + pp., 4to. Nicely-printed, and saddle-stitched and placed in grey paper wraps with tasteful white label on cover with title printed in red. Inscribed inside front cover 'For Desmond + Dorothy - | with love from | the Playwright | Christmas | 1971'. The playlet is an amusing representation of a single night at the 1946-1949 high point of excitement over the discovery of the Malahide Papers ('During three years the incidents described here were repeated several times a week. '), and features among others Isham himself, his cleaner 'Mrs. [ Pamphlet. ] A Summary of the Principles of Socialism. Written for the Democratic Federation, by H. M. Hyndman and William Morris. London: The Modern Press, 13 and 14, Paternoster Row, E.C. 1884. 62pp., 12mo. Disbound without covers. In fair condition, on aged paper, and separated into two parts at pp.16-17. The title-page only gives Hyndman and Morris as the authors, but In type, at end, is the following: 'Signed the Executive Committee of the Democratic Federation, | E. Belfort Bax. | Herbert Burrows. | R. D. Butler. | H. H. Champion, | Hon. Secretary. | W. J. Clark, | Lecture Secretary. | H. A. Fuller. | H. M. Hyndman, | Chairman. | J. L. Joynes. | Tom. S. Lemon. | James Macdonald. | William Morris, | Hon. Treasurer | James F. Murray. | H. Quelch. | A. Scheu. | Helen Taylor. [Francis Almeric Spencer, 1st Baron Churchill.] Autograph Letter Signed ('Churchill') to unnamed male recipient, regarding Mrs Hyde's 'severe affliction', the loss of her husband, Churchill's 'highly respected & esteemed' friend' [Rev. John Hyde?]. Cornbury Park, Oxfordshire. 23 December 1838. 4pp., 12mo. Bifolium. In fair condition, on brittle lightly-aged paper, with closed tears along crease lines unobtrusively repaired with archival tape. Having received the recipient's letter he wishes 'to express my regret that Mrs. Hyde should have considered it necessary to send me any apology on an occasion like the present'. He condoles 'in the melancholy event', of which he 'heard with great regret, and it has deprived me of a Friend whom I highly respected & esteemed'. [Thomas Brand Hollis, radical and dissenter.] Autograph inscription to the antiquary Charles Townley. On a cut-down piece of 4 x 15 cm paper. Laid down on part of leaf from album. In fair condition, on aged paper. Reads 'Mr Townley. | with Mr Brand Hollis | compliments'. Letter and address are on a foolscap 8vo bifolium, with the address covering the first three pages, and the letter the reverse of the second leaf, which also carries the address ('Mrs Hyde | 31, Henrietta Street, | Bath', forwarded to Kew and then 10 New Street, Margate) with ten postmarks and a red wax seal. In fair condition, on aged and worn paper, with a few nicks and short closed tears along folds. LETTER: 1p., foolscap 8vo. Addressed to 'My dear Elizabeth'. Autograph Letter Signed ('Charles W. Dilke') from Sir Charles Wentworth Dilke to Hyde Clarke. 12mo, 1 p. Mourning border. Nine lines. Text clear and complete. Fair, on worn and lightly-aged paper. 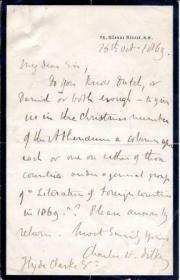 Asks if Clarke knows 'Dutch, or Danish or both enough - to give us in the Christmas number of the Athenaeum a column upon each or one or either of those countries under a general group of "Literature of Foreign Countries in 1869"?' Requests an answer by return. 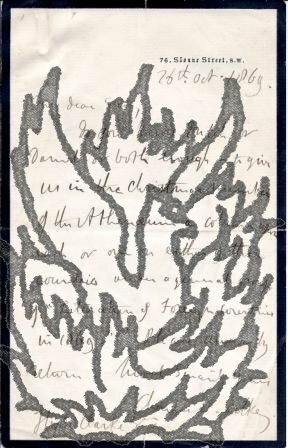 Autograph Letter Signed ('(Thomas Hyde Hills) | John Bell & Co') from Thomas Hyde Hills of John Bell & Co [later John Bell & Croyden], Oxford Street, to the M.P. James Wyld, regarding jury exemption for pharmaceutical chemists. 2 August 1862; 338 Oxford Street, London. 12mo, 2 pp. Fifteen lines. Text clear and complete. Thanking Wyld for his 'Support on Thursday in the House of Commons, agreeing with the Lords' Amendment for the exemption of Pharmaceutical Chemists serving on Juries'. He hopes that the exemption will prove 'a Stimulus to Pharmaceutical education and thereby be of great service and increased safety to the Public'. Hills was Mayor of Cambridge from 1894 to 1895. Autograph Letter Signed Ph. 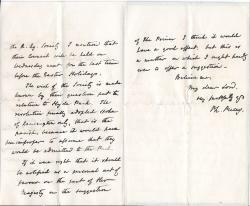 Pusey to Lord Granville, vice president of the Board of Trade in 1848, who took a prominent part in promoting the Great Exhibition of 1851, concerning plans for the Great Exhibition. Philip Pusey. reforming agriculturist and politician. Three pages, 12mo, fold marks, tiny closed tears, mainly good condition. He is grateful that Granville has eased his anxiety. It relieves me from all uneasiness but in case you should consider it expedient to make The Queen's gracious intentions known to the R[oyal] Ag[ricultural] Society. I mention that their Council will be held on Wednesday next for the last time before the Easter Holidays. | The wish of the Society is made know by their question put relative to Hyde Park. 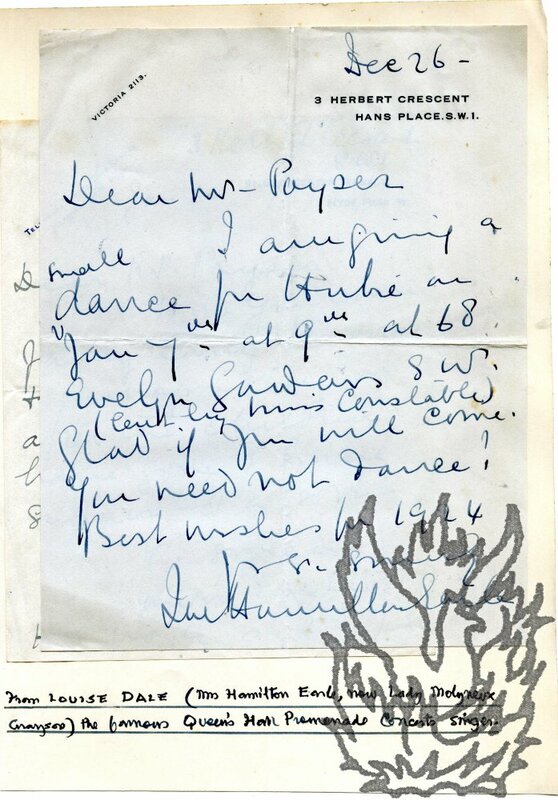 Two Autograph Notes Signed ('Louise M Earle' and 'Lue Hamilton Earle') to Arthur Poyser. The first: 26 December , on letterhead of 3 Herbert Crescent, Hans Place.The second: 8 Jan [1924? ]; 3 Herbert Crescent, Hyde Park, on cancelled letterhead of 91 Gloucester Terrace. Both letters are tipped in on a captioned sheet removed from an autograph album. Both items lightly-aged, but good. 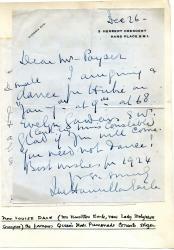 Item One: 12mo, 1 p. Inviting him to 'a small dance for Hubie' at a location 'lent by Miss Constable'. 'You need not dance!' Item two: 12mo, 1 p. Asking him to 'come fairly early' the next day, and to 'stay on after the children have gone & have supper - of a sort'. Refers to 'H's party'. 1914. By E.C. Yeats at the Cuala Press, Churchtown, Dundrum, County Dublin. 4to bifolium (27.5 x 18.5 cm): 3 pp. 300 copies only. Good, on aged paper with a light vertical fold. Hand-coloured illustrations on first (7 x 10 cm) and second (8 x 7.5 cm) pages; black and white illustration ('Drowned Sailor', 12 x 10 cm) alone on third page. Final page blank. The first poem is not ascribed, but is known to be by Hyde. 8 July 1852; 9 Bedford Place, Hastings. 12mo: 1 p. Text clear and entire on creased and slightly grubby paper. Asks Hyde Clark to 'make the preliminary report you suggest, & speak with Mr Crompton'. He feels that 'the thing is to be accomplished; & that there will be honour & profit to all who may concern themselves in the undertaking'. Asks to hear from Hyde Clarke 'in a few days'. The subject of the letter is unclear. 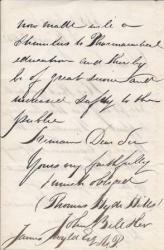 Autograph Letter Signed 'To | the Revd: Doctor Shipley | Canon of Xt: Church | Oxford | by way of London'. Ambresbury [Amesbury]; 22 January [13 February] 1755. 4to: 3 pp. Bifolium. On neatly-repaired aged paper, with archival paper covering the two inner pages. Fifty-four lines of text, all clear and entire. Remains of black wax seal, with crest, on verso of second leaf, which carries the address and is docketed 'Maragna Mohammed'. A long letter in two parts, the second part beginning on the verso of the first leaf, which is headed 'now Febry: 13'. Four Autograph Letters Signed (two in full and two as 'L. H.') to the biblical scholar and Quaker theologian Herbert George Wood (1879-1963), first Professor of Theology at the University of Birmingham. Between 1930 and 1931; all four on letterhead Rosedean Cottage, Shipley, Sussex. All items very good, on lightly aged paper. Four closely written and interesting communications on his writings and philosophy. 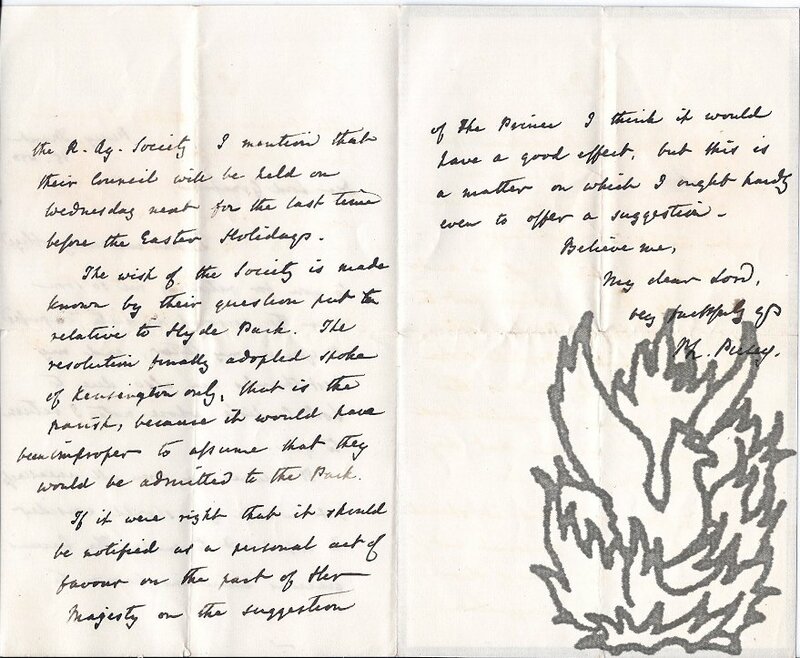 LETTER ONE (16 June 1930, 2 pages, 12mo): On the question of 'that misunderstanding regarding our last visit', the rest of the month is 'booked up', but 'perhaps the postponement - I hope it is no more than that! - of our coming may not be a bad thing'. Since their last meeting he has been 'passing through a phase of extensive internal adjustment, the physical aspect of which has taken the form of very bad health'. Sealed indenture: 'Appointment in fee [by Listowel to Oakes] of No. 3 Prince's Terrace Hyde Park in the County of Middlesex'. William Hare, 2nd Earl of Listowel; William Hare, Viscount Ennismore; Orbell Oakes. Listowel was an Anglo-Irish peer (1801-56) and Member of Parliament for Kerry, 1825-30. Ennismore (1833-1924) was his son, later 4th Earl of Listowel. Orbell Oakes, builder of Nowton Court in Bury St Edmunds, was son of the Bury banker James Oakes, and Receiver of Taxes to the West Division. On one side each of four sheets of vellum, dimensions roughly twenty-seven inches by twenty-two inches, each bearing a tax stamp. Signed and witnessed on the reverse of the last sheet. Schedule detailing leases, feoffments, fines and mortgages between 1813 and 1855. Collins (1788-1847) and Ward (1769-1859) were all artists. Finden (1791-1857) was an engraver. Paper dimensions roughly five inches by four and a half inches. Folded once and with slight discoloration, but in good condition overall. Reads 'James Ward RA. | Edwd. F. Finden | William Collins. | Geo Hyde | Upper Norton St | Philip Hill | 6. Greek Street'.